Ten przestronny apartament w centrum miasta, jest również idealny jako dom, aby rozpocząć się wspaniałe wycieczki samochodem lub rowerem od. W pełni wyposażony aneks kuchenny z kuchenką indukcyjną, Backöfchen, lodówka itp jest doskonały dla self-catering, który będzie ułatwione przez wiele sklepów w okolicy. Ale dzielnica Peter Werder jest również popularny ze względu na jego różnorodnych restauracji i gastronomii. W salonie oferuje doskonałe możliwości komunikacji z TV, DVD, centrum audio i WIFI. Aby odpocząć, ale zaprasza również 6qm duży balkon. Powierzchnia spania z małym biurku jest przytulne rekolekcje. Szczególną cechą jest wyposażenie pokoi z dzieł sztuki przez znanych artystów z Brema. Zatory w podaży? Pytania o idealnej cele, informacji i map? Jesteśmy dla Ciebie! Z nami możesz łatwo i wygodnie SALON - tylko Ty możesz spać tańsze gdzie indziej. Wer Werder mit anfeuert ist uns herzlich willkommen! Die Wohnung liegt fußläufig in der Nähe von Restaurants und Einkaufsmöglichkeiten in einer ruhigen Seitenstraße. Einen Parkplatz haben wir am Wochenende ohne Probleme gefunden. Eine Straßenbahnlinie in Richtung Innenstadt und Schlachte erreicht man in rund fünf Minuten. Die Wohnung ist bequem und geschmackvoll eingerichtet. Der Kühlschrank war sogar für ein erstes Frühstück von unserer netten Vermieterin bestückt worden. Herzlichen Dank für den netten und unkomplizierten Aufenthalt. Absolute highlight of our stay so far. Just can't speak too highly of the apartment and our hosts - Jochen and Mariele. They welcomed us into their home and we felt like part of the family and not at all intrusive. The Welcome Pack included beer, wine, bread butter, milk and water. Nothing was too much trouble and Mariele even took a friend and me to her hairdresser for much needed hair cuts and waited to translate for us as our German language skills left much to be desired. It was our wedding anniversary the day after our arrival and we got home from our walk to find a bottle of champagne on our doorstep. The apartment was exquisitely and tastefully furnished, was spacious, light and airy and the extra large bed was very comfortable. Without a doubt the best apartment we have stayed in and will be the yardstick for all future accommodation. Location - very good. Trams to Bremen only a few minutes walk, river 5 minutes walk and a leisurely walk along the river to Bremen took about 35 minutes. Plenty of restaurants within walking distance and large supermarket 7-8 minutes walk away. All-in-all a very pleasant stay and there is no doubt we will return to when we next visit Bremen. Highly recommended- don't miss the opportunity to stay here. Many thanks Jochen and Mariele. We are very much looking forward to meeting you again! It was a real pleasure to have you in our house. Thanks for having chosen us for your stay in Bremen. See you! This place is spectacular. It is homey mixed with old world charm & a great collection of art & furnishings. It’s in a great location right near the water & the soccer stadium. The hosts were so very helpful and gracious. We really loved everything about this place. When we returned in the evening & could smell the wonderful smells of their cooking, it really felt like home. I am already plotting to find a way back to this charming place. An excellent property - we loved it! 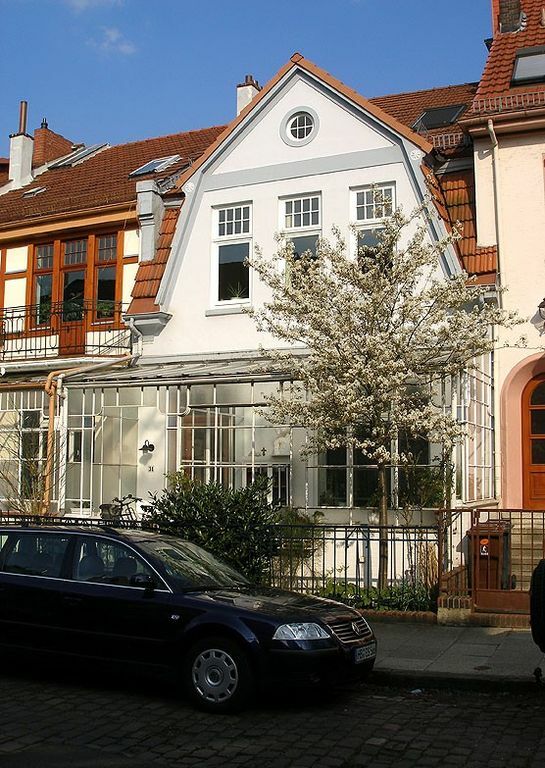 This apartment is comfortable, well designed, very well stocked by the wonderful owners and offers everything you could possibly need for your stay in Bremen. Close to tram stops, good supermarket, restaurants and shops. There is a lovely feeling of space due to the open plan layout, the king-size bed was very comfortable and the bathroom outstanding. The house itself is lovely and the neighbourhood attractive. Very highly recommended. Man kommt rein und fühlt sich wohl. Wir freuen uns schon auf den nächsten Besuch in Bremen. Mieszkanie jest w centrum miasta i jest łatwo dostępny tramwajem linii 3 od centrum, dworca kolejowego i lotniska. Ponieważ również leży bezpośrednio na zielonych obszarów Wezery, można przyjść na rowerze do centrum miasta, tu w drodze na piechotę w ciągu 20 lub 10 minut. Więc można również uruchomić mile wspaniałe przejażdżki rowerowe z nas chociaż. Możesz przeczytać więcej na stronie www. galeria-Brema mieszkanie. de nauczyć. Für nur 2-3 Nächte beträgt der Preis pro Nacht 110,- Eur. Darüber hinaus 95,- Eur. Der Zuschlag für eine 4. Person, bzw. jede weitere beträgt 15,- Eur. pro Nacht. Besondere Arrangementangebote auf der Internetseite www.apartmentgalerie-bremen.de .Monats- oder Langzeitmietpreise nach Absprache.